The Da Buddha is the ultimate desktop vaporizer for whip aficionados. It was created by 7th Floor vaporizers, which is a highly distinguished brand, and this particular unit gets props for its beautiful craftsmanship, affordable price tag and superb vapor quality. Consumers that wish to enjoy lengthy sessions with a whip on a gorgeous desktop device with pure convection heating need to look no further. The Da Buddha is a prime example of a mid-level desktop unit, and it touts a retail value of $199.95. At this price, customers should expect dense, delicious clouds, and this product does a great job of providing just that! It’s important for users to note that the Da Buddha is only compatible with a whip assembly (consumers should consider upgrading to the Volcano if they are bag enthusiasts), and the device currently carries a three year warranty. 7th Floor Vaporizers is a company that is both well-loved and widely acknowledged as one of the top vape manufacturers in the industry. This brand has withstood the test of time, as they have a variety of other units such as the Silver Surfer that have proven to be excellent over the years. 7th Floor Vaporizers is acclaimed enough to compete with businesses such as Storz n Bickel, and Ghost. Using the Da Buddha is as quick and easy as a snap of the finger. First ensure the unit is plugged into an electrical outlet, then simple turn it on by moving the knob. The initial, first time usage of the device requires users to keep the device on and running for ten minutes, but for normal everyday use, it will only require users to wait about two minutes for it to heat up. Next, while the device is heating up, load some finely ground herb into the wand. Finally insert the end of the wand into the cylinder, and start enjoying a perfect, delicious session. The cloud quality of the Da Buddha is out of this world fantastic. It takes a bit to get adjusted to using the temperature knob to find the perfect temperature but once users master this, every single hit is guaranteed to be smooth, dense, and scrumptious. Users can also tailor their own experience by inhaling deeply for around five seconds to enhance flower flavor and to have a more intense experience. Overall, the vapor quality is a solid 10 out of 10 for the price. The Da Buddha is a desktop vaporizer, which means is designed for users that want to enjoy their medicine at home. It weighs a hefty five pounds with the whip assembly and it’s slightly over 13 inches tall. 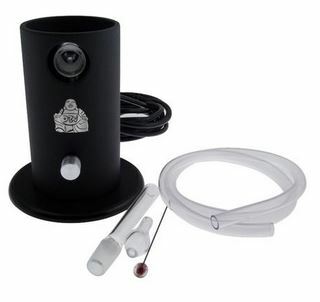 The build and overall look of the device is appealing, as it features simple cylindrical body with a port for the wand, and a prominent, proud Buddha logo on display near the knob. The Da Buddha is the best kind of desktop device in regards to facility of use. It requires no effort to use, and there is no learning curve. All users have to do is turn it on by moving the knob, let it heat up for two to three minutes, and then place the end of the wand loaded with herb into the port, and begin inhaling. That being said consumers should be aware of the temperature of the wand between draws since it’s possible for the herb to burn a bit if the wand overheats. Basically, it’s simple to use, it just requires users to pay a bit of attention. The Da Buddha is a pure and reliable convection vaporizer. It boasts a large temperature range which can be adjusted by moving the knob. As one turns the knob more towards the right, the temperature will gradually increase. 7th Floor Vaporizers recommends placing the knob in a 2:00 position when users are first trying out Da Buddha. Unfortunately, there are no set written temperatures on the device so it will be a matter of consumers placing with control knob until they discover what they like. However, a word of caution here is necessary- do not turn the knob completely to the right past 5 o’clock, since this will result in overly hot temperatures, and the herb will definitely get burned. The Da Buddha is a desktop vaporizer and gets plugged directly into an electrical wall outlet for its source of power. It is not battery operated, and will not function without outlet access. The Da Buddha was created specifically for whip fans, and it serves its purpose beautifully. Its use of a ceramic heater combined with a hand-blown glass wand works together to produce the tastiest, highest cloud quality. The price point is pretty good. 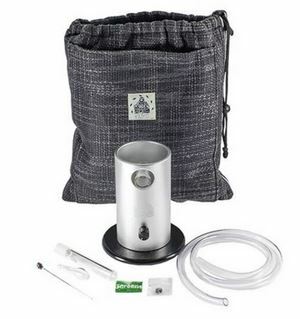 There are comparable desktop devices such as the Arizer V-Tower, which is also only used with a whip assembly, and they cost about the same. It’s impossible to figure out what temperature the herb is being vaporized at! The knob is easy to use, but it would be great if consumers could have an actual number for reference. It’s only for whip users. Anyone wanting variety, and desiring to get their dose through a bag will have to choose a different unit. The Da Buddha is going to be a great deal for customers that know exactly what they want. If you’re looking for an attractive mid-to-high end desktop device, with great cloud quality and the ability to take heavy hits via a whip, this will be the correct selection for you.